WHO ELSE WANTS AN IRRESISTIBLE CV AT A RIDICULOUSLY LOW FEE TO LAND THAT HIGH PAYING JOB? Did you know that your biggest obstacle to securing your dream job is not your qualifications or lack of experience? Submitting a tasteless, 1980’s format CV and hoping to get past the CV screening stage to score an interview is like throwing a tiny hook into the Atlantic and expecting to catch a whale. It’s a dead-end. Millions apply for a few thousand jobs, thousands apply for a few hundred opportunities (think scholarships, fellowships, internships, and grants) so a less-than-wow CV will end up in the trash can. By popular demand, you can now hire an expert who’s been selected among 100 outstanding young leaders in the world (33 Sixty, Scotland) 35 most inspiring youths in Africa (NED, USA) and was honored by the government as an outstanding corps members (NYSC, Nigeria). 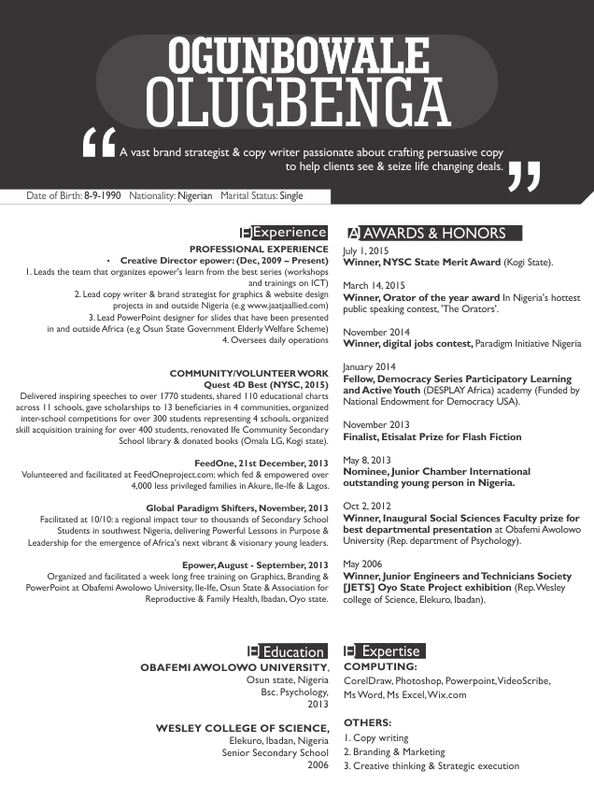 A DESPLAY fellow, League of Extraordinary Young Persons (LEXY) fellow, PIN digital jobs winner and NYSC merit award winner, watch Ogunbowale Olugbenga breathe life into your ‘old’ CV, brand your achievements, boost your prospects, deploy exquisite design and just like He helped numerous folks, help you land your dream job. “I was initially skeptical about the CV packaging thing but my husband asked me to give it a try. That trial proved to be an instant success: I landed a super job at Heritage bank. 1) Your CV will be fully customized for you and for the company/industry/opportunity you wish to apply for in 48hrs or less. 2) Every word will resonate, the design will detonate. 3) By popular demand, the fee has been crashed to N1,950 (from N5,000)! Now you have no excuse, no reason to spend one more month at home doing nothing. Super charge your job search, super charge your life. READY FOR THAT IRRESISTIBLE CV? ****This offer will not last for long, take action today. ****Rebroadcast if you find useful.